That was a 5:45 minute stop for Sanders that watched his deficit to Rapp grow to +13:17. He also lost two positions on the course and is now riding in fifth. Do we seem him throw out his patience game he has been playing for much of the ride? Ellis has settled into a pace that sees her lead holding steady to around +7:00 on Blatchford at 108 km's. Lyles is riding in third, +13:13 and Thibodeau in fourth, +15:37. If you take Rapp out of the equation for a moment, second through fifth positions in the men's race are riding within five and a half minutes of each other. Limkemann has motored past Ambrose and is now riding in second, +8:02, with Ambrose is third +8:08 and Sanders riding in fourth, +13:02. The gap between Ellis and Blatchford is now down to 6:22 at 114 km's. Is Ellis fading a bit, or is Blatchford upped her pace? 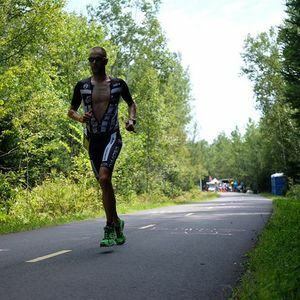 At 114 km's, Lyles is riding in third, but has slipped further back to over 14 minutes off the pace while Thibodeau still holds onto fourth at +16:15. Ambrose has reclaimed second place after he passed Limkemann. Both are looking at a +8:20 - +8:24 deficits at 130 km's. At 143 km's, Rapp's lead is 8:47 on Ambrose, +9:00 on Limkemann, while Sanders is going backwards and is now looking at a +14:16 deficit. Ellis has inched her lead up to +6:50 on Blatchford as the lead pair bike through 130 km's. Rapp's lead is over nine minutes now as he picks his way through the age groupers at about 150 km's into the bike. If we look second through fourth in the men's (Ambrose, Limkemann and Sanders) there is only six minutes separating them at this juncture of the race, so this situation has all the makings of a good race once the run starts, and in particular with a running talent like Sanders being in the mix. Ellis continues to grind away and has reestablished a lead of over a seven minute on Baltchford at 135 km's. 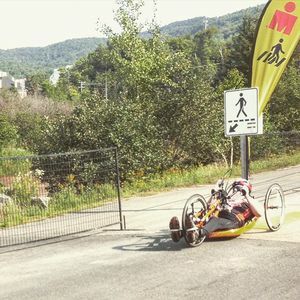 Rapp is showing no chips in his armor today so far as he rides through 155 km's with a +9:23 lead on Ambrose, 9:42 on Limkemann and 15:14 on Sanders. Blatchford is loosing time with each passing km here in Quebec. She is now riding +7:25 back of Ellis, while Lyles and Thibodeau have both slipped to over 18 minutes off the pace at 139 km's. Rapps lead has grown to 10 minutes on Ambrose at 160 km's. Limkemann is just behind Ambrose in third, while Sanders is cycling in fourth, but looking at a +16:28 deficit. Ellis's lead is holding solid at around 7:45 ish on Blatchford at 148 km's. Donavan has just overtaken Lyles for third with both women are riding at +20:23. At 163 km's, Rapp's lead is 9:56 on Ambrose with Limkemann riding in third at + 10:05. Daerr has passed Sanders and is +14:52, while Sanders has slipped to fifth, +16:38. 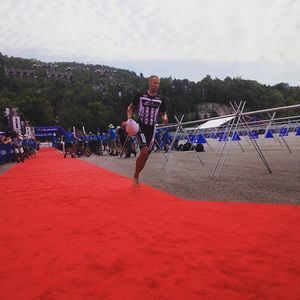 #IMMT @rappstar is first off the bike with a bike split of 4:25:02! Ellis at 160 km's has a +8:03 lead on Blatchford, +20:47 on Donavan, +21:52 on Thibodeau and +22:28 on Lyles. Rapp is out front early on the run and we have Ambrose and Limkemann running together +12:45 back to the leader. Rapp is at 6.6 km and Ambrose and Limkemann have just run through 3.25 km's of the run. Ellis has just rode through 176 km's with a +9:10 lead on Blatchford. Ellis is off the bike and running into the transition now. 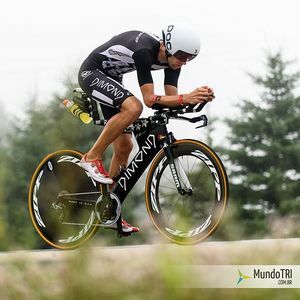 Ellis recorded a 4:53:21 bike split today. According to the GPS tracking we have Baltchford at 175 km's on the bike course and Ellis at 1 km on the run course. Blatchford off the bike in second, +9:47 back to Ellis. Rapp's lead at 12.5 km's is now sitting a +13:29 on Limkeman and +14:09 ambrose, +16:52 on Daerr and +17:55 on Sanders. Ellis's lead at 5 km's was +9:50 on Blatchford. Piampiano has run her way into third and looking at a 21:02 deficit. Eillis's lead was +9:45 at 4 km's into the run.